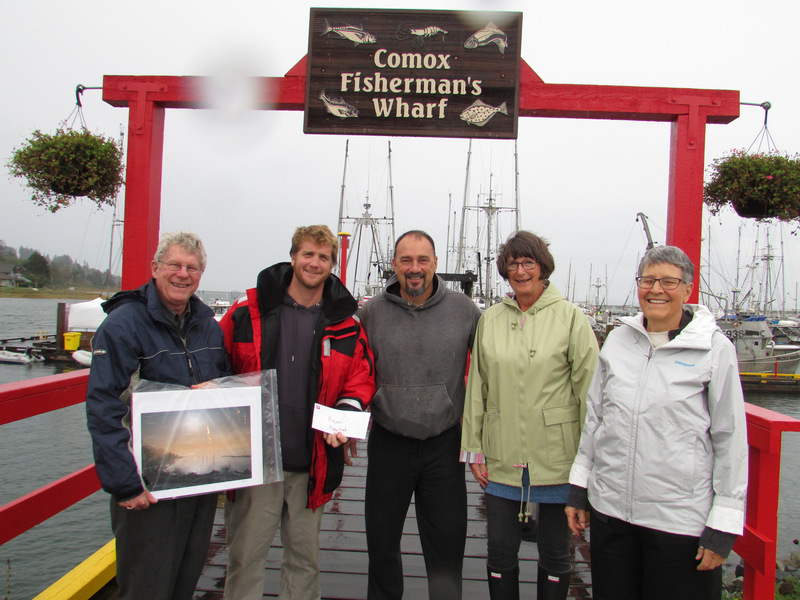 Brian Storey (far left) and Barbara Wellwood (far right) accept a generous donation from (l to r) Rob Clarke, Lito Veloso and Elizabeth McLeod of the Comox Valley Harbour Authority. 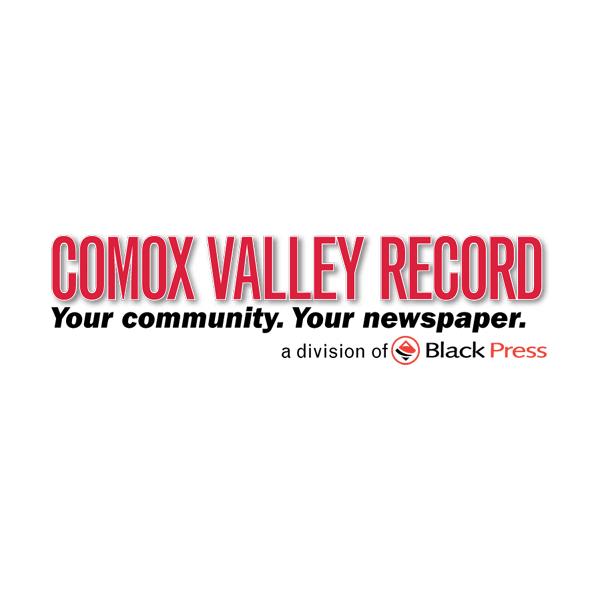 The Comox Valley Harbour Authority held the first ever “Comox Harbour Hole in One” competition at Comox Nautical Days. They put a “T Box” in the Comox Harbour parking lot with the “Floating Hole” approximately 100 yards away in the water between the docks and the Black Fin. Almost 500 stepped up and gave it their best shot with only one achieving the goal of landing on the floating hole. Donations of $1 per ball were accepted and resulted in a donation of $550 to Project Watershed. We would like to thank them for their generous donation of the proceeds of this competition as well as for the donation of dock space earlier in the summer for our eelgrass team to prepare eelgrass stems for transplanting near the Royston Wrecks. 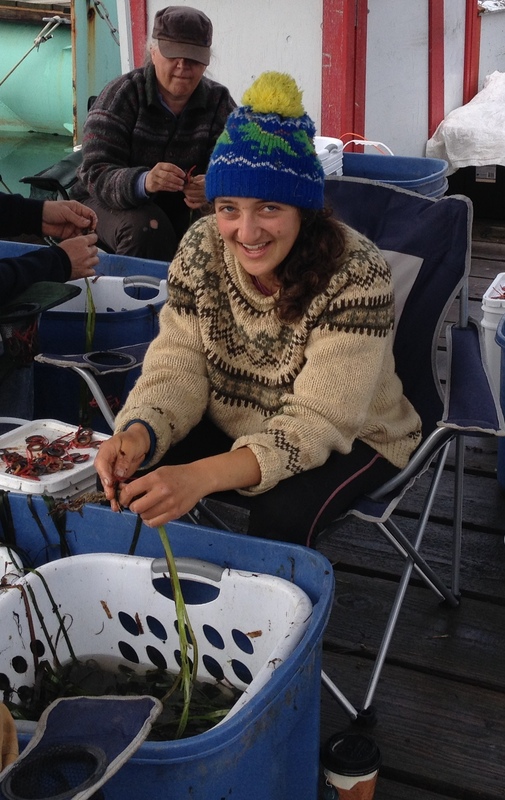 Pacific Institute of Climate Solutions summer intern and UBC student Maya Guttmann tying eelgrass bundles for planting with the shore crew. During the second and third week of July, Project Watershed carried out a sub-tidal eelgrass planting of approximately 1,000 square metres. 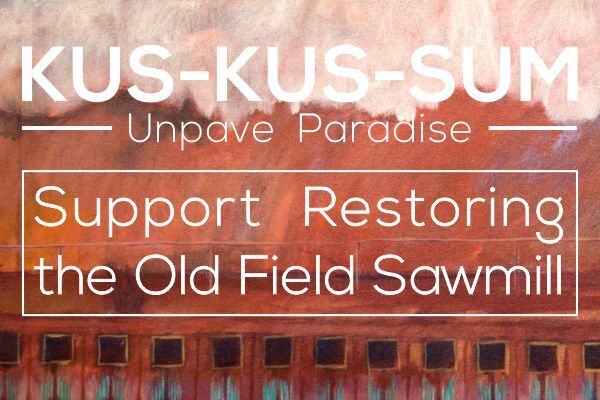 “This makes our total restorations to nearly 6,000 square metres since 2013,” said Paul Horgen, board chair. 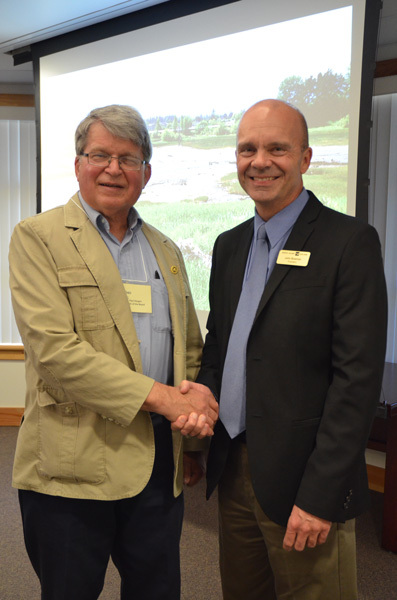 Funding for this 2015 effort was through the Pacific Salmon Foundation. There was a 2014/15 estuarine tidal marsh restoration and establishment of a kelp seeding site that were earlier phases of a plan to link saltmarsh, eelgrass and kelp habitats. “Many volunteers and professionals have committed to our estuary vision, but we would especially like to acknowledge the Comox Valley Harbour Authority as they have donated the dock space for the tying and they carried out a hole-in-one event during Nautical Days where the proceeds will be donated to Project Watershed,” said Kathryn Clouston, administration and outreach assistant. “Tidal marsh restoration is part of rebuilding the salmon highway which was seriously damaged during the years of log booming and industrial activity in our estuary,” said Horgen. If you have been down to the Airpark lately you may have noticed the pathway has been closed over the past 2 weeks so that a team of hardworking engineers, machine operators, project managers and laborers could install a culvert under the Airpark Walkway. This work is the culmination of four years of study and planning. The culvert is 20 meters long by 3.98 meters wide and 2.48 meters high and is designed to direct river flows through the lagoon area. This will flush and re-oxygenate the area with cooler river water, and restore the lagoon closer to its historical condition. 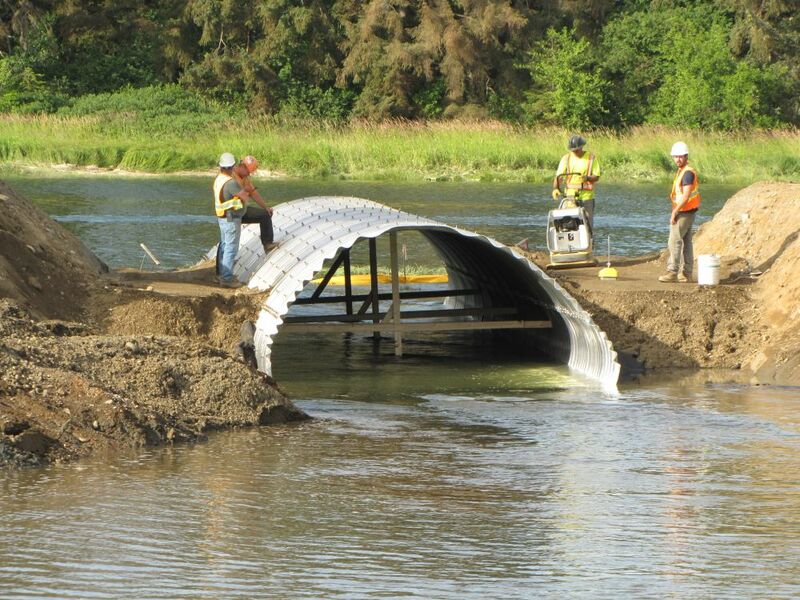 The construction, coordinated by Project Watershed, will significantly improve fish habitat and deal with factors limiting productivity by helping lower water temperatures in the lagoon, increasing nutrients and mixing, providing better habitat for birds and marine life and improving connectivity between the river and the lagoon. Salt Marsh benches of gravel and recovered sediment have been created for salt marsh planting both in the lagoon and in the estuary south of the lagoon. These marshes will provide connectivity between the lagoon and estuary habitats. The benches in this area will also protect the shoreline from storm surges and erosion thereby protecting the trail infrastructure. Saltmarsh species will be planted next spring. 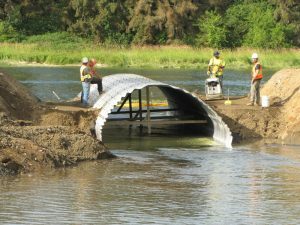 The culvert and salt marsh restoration project is made possible thanks to funding from The Fish and Wildlife Compensation Program, Recreational Fisheries Conservation Partnerships Program, North American Partnership for Environmental Community Action, and the City of Courtenay. Paving will take place on June 30th and the pathway will reopen on Canada Day. 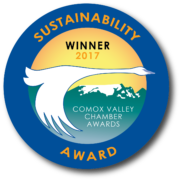 NIC will sign a Memorandum of Understanding June 4 with Comox Valley Project Watershed to restore the estuary environment and research new guidelines for blue carbon research in B.C. Comox Valley Project Watershed Board Chair Paul Horgen and NIC President John Bowman sign a Memorandum of Understanding agreeing to work together to restore the K’ómoks Estuary and research new guidelines for blue carbon research in B.C. 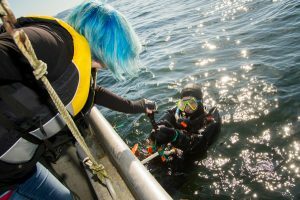 “NIC students are bringing science to life – mapping eelgrass, improving estuaries and creating positive change in their own community,” said NIC Science Department Chair Christine Hodgson, who is also a Project Watershed member. Blue carbon is carbon captured by salt marsh grasses, eelgrass and other aquatic plants. The grasses provide critical fish habitat, storm surge protection, and value for shellfish operations. They also absorb carbon up to 100 times faster and more permanently than terrestrial forests – making their habitat crucial to understanding and reducing CO2 levels in the atmosphere. Project Watershed is the leader in blue carbon research in the K’ómoks Estuary. It researches, plants, and maps eelgrass and salt marsh grasses. In 2014, it received federal recognition and a $230,000 grant from an international research institute on climate solutions, as well as a $10,000 provincial grant to hire a student summer intern. The agreement could create a protocol for other coastal communities interested in restoring their own estuaries and support the creation of blue carbon greenhouse gas offsets under the B.C. offsets system. 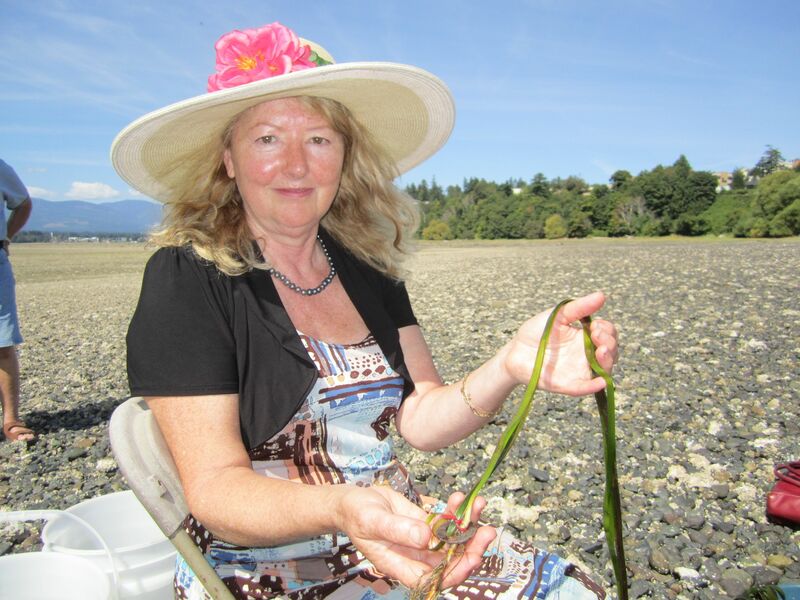 “There are many opportunities for the public and communities to get involved by planting intertidal eelgrass and restoring the shoreline with us,” said Paul Horgen, the Chair of the Board of Directors for the Comox Valley Project Watershed Society. 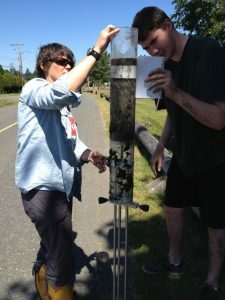 In conjunction with NIC’s Centre for Applied Research, Technology and Innovation, Hodgson received a $25,000 Natural Sciences and Engineering Research Council of Canada (NSERC) grant to map the distribution of eelgrass relative to Shellfish Aquaculture sites, and monitor habitat with NIC students, the K’ómoks First Nation, Pentlatch Seafoods and Comox Valley Project Watershed. NIC student Jamie Lund’s research into the distribution of eelgrass beds near the Royston Wrecks involved Project Watershed and a group of K’ómoks First Nation students. Her work, as well as Beatrice Proudfoot’s digital estuary maps, were presented at a Project Watershed Conference in the Comox Valley in March. For more information on applied research at NIC visit: www.nic.bc.ca/CARTI. 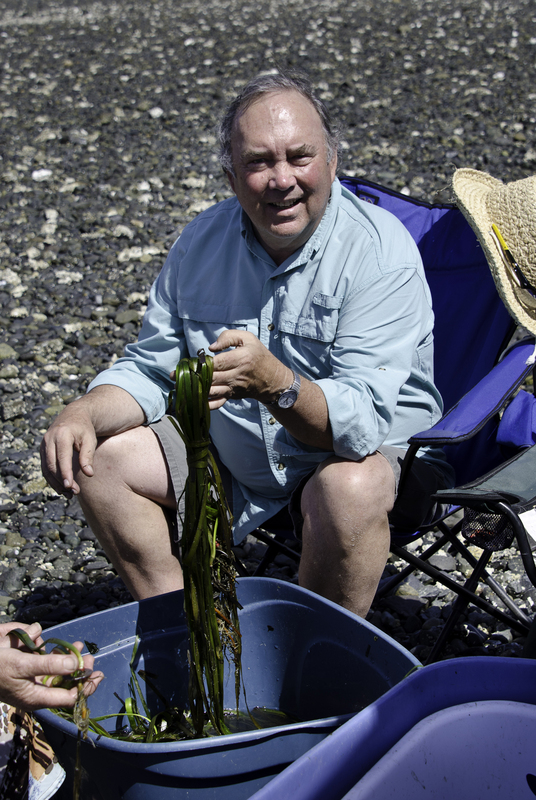 Project Watershed needs volunteers to help transplant eelgrass for our Blue Carbon project. As you have probably heard by now, we have received funding to develop a protocol to determine how much carbon is sequestered by eelgrass in the estuary. We have marked out the plots and taken our sediment samples and now we need to fill them in with these amazing plants that remove carbon from the atmosphere better than mature coniferous trees, reduce storm surge damage to the shoreline and provide great habitat for tons of different critters, from fish to shellfish to crab to whatever. We will be harvesting the plants from around 9:00 am until around 11:30 am and then tieing washers to them for a few hours on 8 Aug.
We will then be transplanting the prepared eelgrass from around 10:00am until around 12:00pm on 9 Aug. Lunch will be provided so please let us know if you can volunteer alongside Project Watershed staff on either or both of these days. Your time and energy is greatly appreciated!